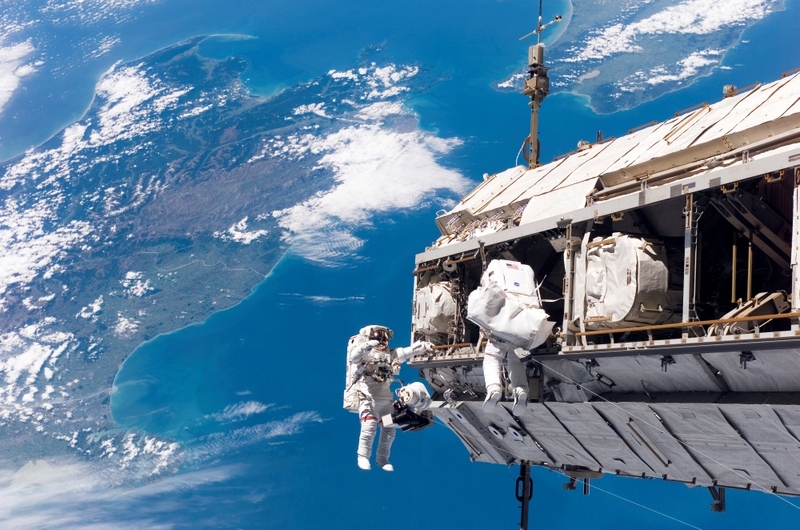 Low Earth Orbit – The most boring kind of orbit. Anything orbiting below an altitude of 2000 km is in a low Earth orbit because 2000 km isn’t very high up – it’s not even high enough for the Earth’s gravity to be substantially diminished in any way, so the only reason you see astronauts larking about in what appears to be zero-G on the ISS is that they’re technically freefalling around the Earth. Nevertheless LEO is a very, very attractive orbit to put satellites in because it is comparatively a very easy and cheap orbit to reach. The main problem rocket engineers face in boosting stuff to higher orbits is that they need more fuel to do so. Then they need to carry that extra fuel up to where the rocket was originally going to do, so they need more fuel to do that. And to get the extra extra fuel up to where… anyway, it’s much less of a headache for them if you just park your satellite a few hundred kilometres above the surface of the Earth, which is a perfectly cromulent orbit for 90% of satellite applications. It’s not without its drawbacks, however; the major one being that if you don’t put your satellite very high up it’s still going to be partially within the Earth’s atmosphere, and thus subject to atmospheric drag as gas molecules bounce off the surface of the satellite and reduce its orbital velocity. If we just left satellites in Low Earth Orbit they’d eventually drop out of the sky and plummet back down to Earth because losing orbital velocity means losing orbital altitude. 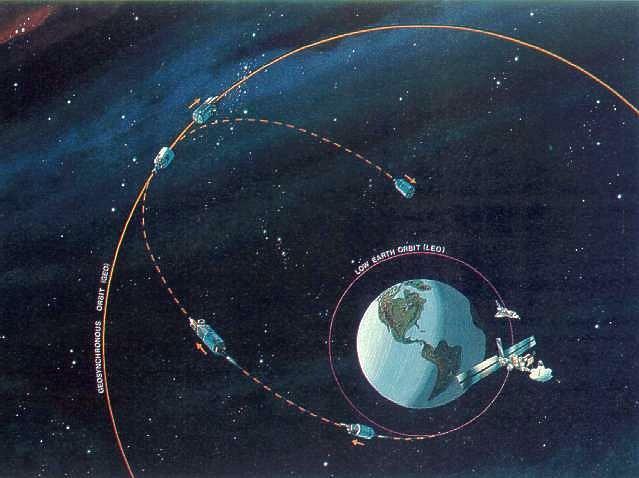 So satellites in Low Earth Orbit have to do a lot of what’s called station keeping – that is, orbital adjustments to counteract atmospheric drag and other effects which alter the satellite’s orbit in order to keep the satellite on station where it should be. 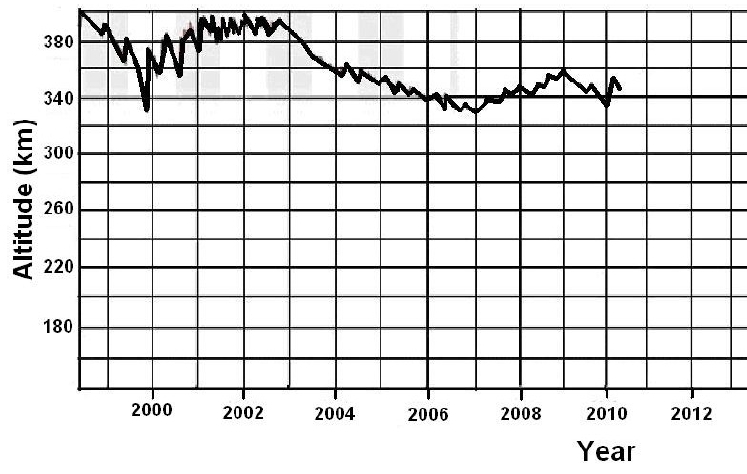 For example, this is a graph of the orbital altitude of the ISS since it was launched; the altitude decreases over time because of drag, and every so often it gets boosted back up to a higher orbit by one of the supply vehicles they regularly send up to it. Polar Orbit – A special variant of the Low Earth Orbit that’s been specifically shifted to have an orbit that’s inclined ninety degrees to the equator – in other words, it orbits from pole to pole. This is useful because it means that as the Earth rotates underneath the satellite, the satellite flies over a different part of the Earth every time it makes an orbit. If you orbit your satellite at a low enough altitude – say, 600–1000 km – then it will have both a very short orbital period (often 90 minutes or less) and be close enough to the Earth’s surface to get some very, very nice pictures of all the pretty scenery down there. The Polar Orbit is therefore of especial interest to people who like to look at stuff on Earth – i.e., Earth imaging scientists and spy agencies. 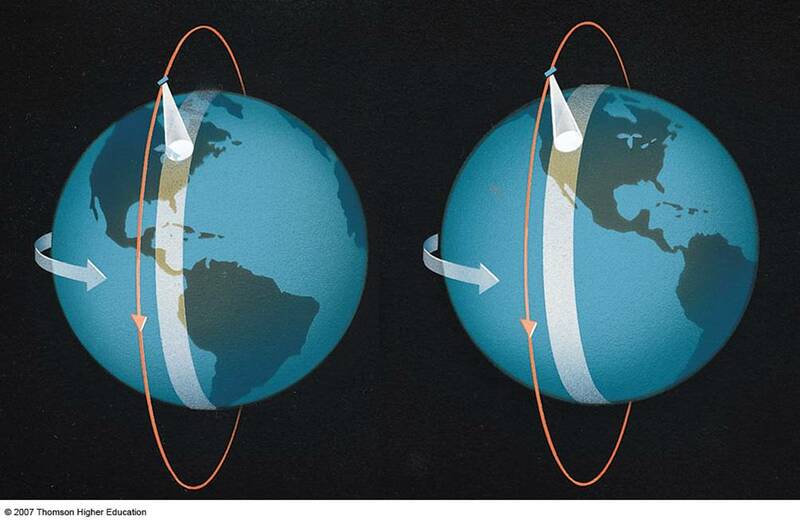 Geostationary Orbit – The higher an orbit you have, the longer it takes for you to go around the Earth. Since they aren’t very high, satellites in LEO orbit the Earth very very quickly. Sometimes this is desirable, as in the Polar Orbit example above. Most of the time, however, it is not. Quite aside from everything else, if you have a satellite zipping around the Earth at an orbital velocity of several kilometres per second it makes communicating with the bloody thing an absolute nightmare. Even if you know where it is and you have an antenna that can track it as it moves across the sky, eventually the satellite is going to disappear below the horizon and you’re going to be out of contact with it until it comes back around the other side of the Earth. This is not ideal, since if you want to be in communication with the satellite 100% of the time you have to build a daisy chain of satellite ground stations dotted around the planet so that it’s never out of your line of sight. The solution to this problem is the geostationary orbit. 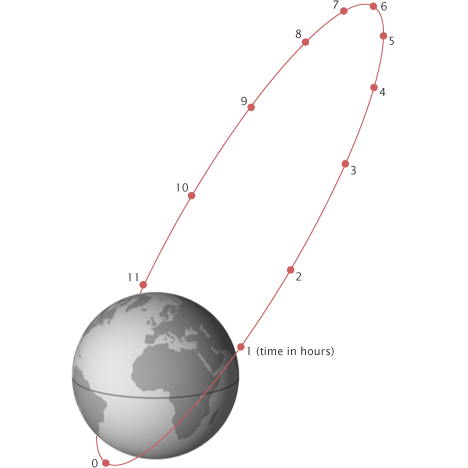 If, as you go higher, the orbit of the satellite takes longer, then it follows that eventually you’re going to find an orbital altitude where the orbital period of the satellite is equal to the rotational period of the Earth – in other words, the satellite goes around the Earth once a day. This means that it orbits at the exact same rate as the Earth rotates, and so if it’s got an inclination of zero it constantly remains above the same point on the Earth’s equator. (Hence geostationary, or geosynchronous – it’s stationary with respect to the Earth.) This is a good orbit for communications satellites since once they’re moved into position they’ll never be out of contact with the country that launched them. It’s also good for other nation-specific applications, like weather monitoring. The drawback is that you need to go very, very high up in order to get an orbital period of 24 hours. 36,000 km up, in fact. That sort of thing requires a lot of fuel. Molniya Orbit – Unfortunately the fact that you need to orbit stuff around the equator to achieve a geostationary orbit can be a bit difficult if you’re a country that happens to have most of its land mass located at high inclinations – say, for example, if you’re Russia. Since your line of sight to a geostationary satellite has a high angle of incidence, you’re going to need a lot more power to communicate with it. Additionally getting something to a geostationary orbit from the highly-inclined Russian launch sites is also very tricky. The Russian solution is the Molniya orbit. Unlike the other orbits described here a Molniya orbit is highly elliptical – that is, its perigee (point of closest approach to the Earth) is a thousand kilometres or so, but its apogee (point at which it is furthest away from the Earth) is 40,000 km up on the opposite side of the planet to the perigee. If you arrange matters so that the perigee is above the bit of the planet you want to look at/talk to, you can get almost all of the benefits of a geostationary satellite out of it since it’ll be spending 80% of its time on one side of the planet and while it’s doing this it’ll be in line of sight of your country of choice. Unfortunately while the Molniya is a very neat idea it’s not without its drawbacks; namely that you need directional antennae to track it as it moves through the sky as well as multiple satellites in a constellation to provide 24-hour coverage while one or more of your satellite constellation is out of contact on the other side of the planet. Hohmann Transfer Orbit – Okay so these orbits are all very nice, but what if we want to orbit something around a planet/moon that is not the Earth? How do we even get there? Contrary to what Hollywood would have you believe, spacecraft that go to other planets don’t just point themselves at the planet and then blast off because this would take a shedload of fuel and also you have to account for the gravity of everything else in the Solar System at some point. Instead they enter something called a Hohmann transfer orbit. This is a special type of orbit because the spacecraft will only travel along it for as long as it takes to get to where it’s going. The idea is this. You’ve got your spacecraft going round the Earth in what’s called a parking orbit. The objective is to get to a destination orbit that is different — geostationary orbit, say, for the most simple example, or an orbit around the Moon or Mars. Instead of trying to get there directly by burning fuel, the idea of the Hohmann transfer orbit is to let gravity do the work for you. The spacecraft just makes one brief burn to get itself onto the Hohmann orbit, which is an elliptical orbit going around the Earth or the Sun or whatever which just happens to intersect with both the parking orbit and the destination orbit. You sit back and wait for a couple of months, and then when you get to where you’re going you burn the engines again to shift the satellite to the destination orbit. It’s a very simple and elegant way of getting around the Solar System, and the only drawback is that it’s introduced the charming concept of the launch window — that is, you have to wait until the starting point (Earth) and the destination are in the right positions relative to each other for a Hohmann orbit to exist. Miss that window, and you have to wait for the next one. But then, as you should have learned by now, you don’t get anything for free where space travel is concerned. Mlur. Sorry you had to sit through that. Hopefully there will be some payoff coming very, very soon. Molniya means lightning. No… I don’t know why we call it that. Why do we call it that? Because lightning strikes from 40,000 km up DIDN’T YOU KNOW THAT KENTI. No, it’s because the first satellites to use that sort of orbit were called Molniya. I don’t know why Low Earth Orbit isn’t called Sputnik but eh. Lightning is still a weird name for a satellite. Almost all the other names I can understand, either in a capacity of how it relates to the activity, or the ideological soviet bent. But Lightning?